Welcome to my Focus on Fishing website. Focus on Fishing is part of amBASSador Angling Services, a small company I started in 1986. It encompasses all my freelance outdoor writing, photography, fishing courses, seminars, tournament fishing, guiding excursions, consulting, product field testing, corporate fishing events and of late my Hooked on Fishing video clips. Look for regularly updated articles and fishing information that will help you catch more fish and hopefully entertain you at the same time. Thanks for visiting and I hope you cast a line here often. 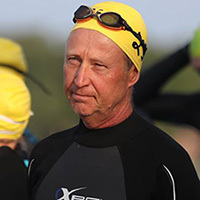 Saturday August 11, 2018 seemed like a long ways off way back in March, but as soon as I heard the date, I quickly marked it down in my calendar for the annual Sun City Swim in Orillia. Orillia Ontario. 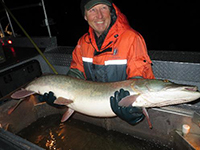 Award winning outdoor writer and seminar host Wil Wegman of Bradford Ontario is recognized far more within the angling community than among high level swimmers. He was voted into the Canadian Angler Hall of Fame, in 2017, so he might be better known for catching fish than swimming with them. Southern Ontario has some remarkable bass fishing! I love fishing our home waters from the day after our season opens (3rd or 4th Saturday in June) until it closes November 30th. During that period of time all the bass I catch, are live released – to help sustain our local fisheries and to provide the same joy I had for other anglers lucky enough to catch those same fish. 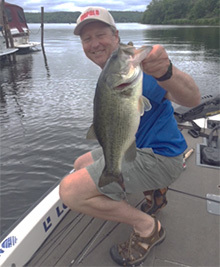 Yet despite these great opportunities … we are still missing out on some exceptional catch and release fishing experiences, and that is why I like many other Ontario anglers, make a short trip south of the border into nearby New York in the spring. A Great Day of Pre-Fishing for the 2018 Lake Simcoe Ice Fishing Championships! So the other day I decided to hold off fishing Lake Simcoe's Cooks Bay until later in the afternoon. I wanted to see if the deepwater largemouth bite was better later in the day - because so far this September, it's been non existant. As I turned off Hwy 11 at Churchill, I saw a man walking along the road, who quickly decided to stick out his thumb when he saw me and my boat. Why, after at least 20 years of sadly passing by hitchikers, I instinctively pulled off the paved road onto the gravelly shoulder is beyond me. We've all become far more atune to the high risks of both hitchiking and picking up random hitchikers. Maybe it was because he looked so determined to get somewhere and that hitchiking was not his regular means of travel. Perhpas it was simply I was tired of not trusting my gut instincts ... who the heck knows, but I unlocked the passenger side door and he gingerly climbed in.